Hello and welcome to my website, which displays many of my favourite wildlife images I have taken over the years. My name is Kevin Elsby and I live in East Anglia in the United Kingdom. I spent my career as a family doctor but since I was a child I have had a deep interest in the natural world. I started off as a bird watcher, but over the years since, my interest has expanded to encompass all elements of nature, from butterflies to reptiles and from whales to orchids. I have an Honours B.Sc. in Natural Sciences with Earth Sciences, and a Masters in Wildlife Biology and Conservation. I have always enjoyed travelling as a way of seeing new wildlife and over the last 20 years I have expanded this by becoming a wildlife tour guide for Naturetrek, a UK-based wildlife holiday company. I have led trips to many destinations, including Costa Rica, Svalbard, the Gambia, Kenya, Crete and Mallorca. In addition to this, I am regularly asked to speak on wildlife themes on cruise ships in many parts of the world, such as the Galapagos Islands, the Amazon, Antarctica and Europe. 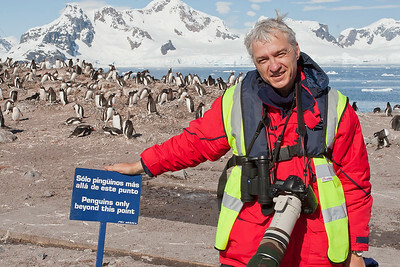 I have visited Antarctica several times as an expedition team. My interest in photography started in the early 1980's. I am a Fellow of the Royal Photographic Society (RPS), and I sit on the distinctions panel for this organisation. I am currently Chairman of the RPS Nature Group. I am constantly striving to improve my own photography and am always pleased to be able to discuss photography techniques with like-minded individuals. I hope you enjoy looking through my image galleries, which are arranged by groups of organisms. I would be delighted to read any feedback via e-mail.